The deep fjords of East Greenland are extraordinary. 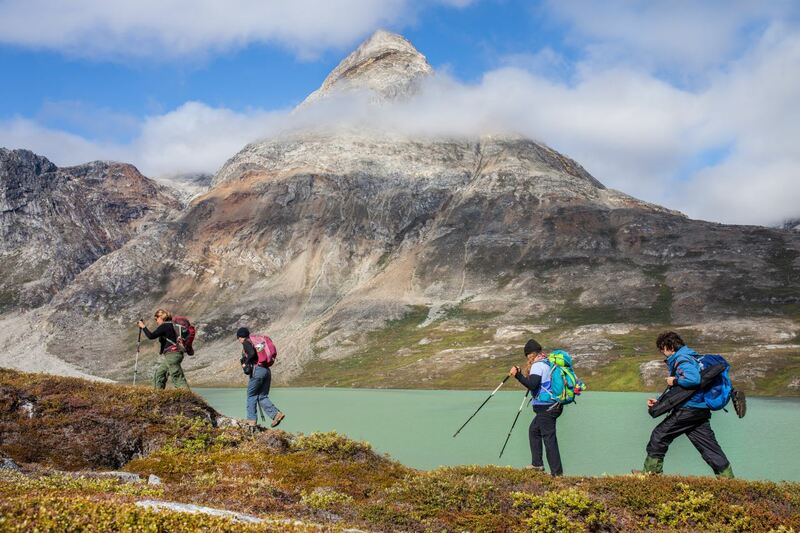 Deep blue-green sea, steep granite mountains with sharp peaks, lush arctic vegetation around creeks, lakes and ice. Lots of ice! 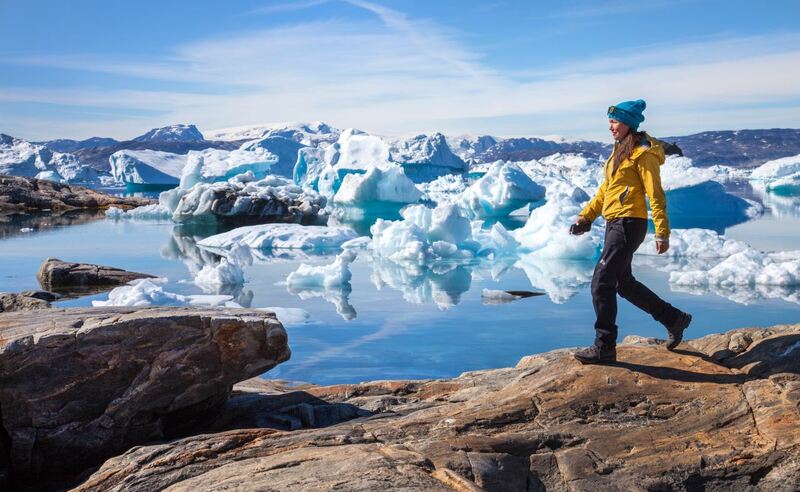 The Sermilik fjord, or the Ice fjord in the local’s language, certainly lives up to its name, it is full of icebergs of all sizes. Several glaciers calve into the fjord and one of them, the Helheim glacier, is thought to be one of the fastest moving glaciers in the world. On the other side of the fjord, one can see the edge of the massif Greenland ice cap, the world’s second biggest ice field. 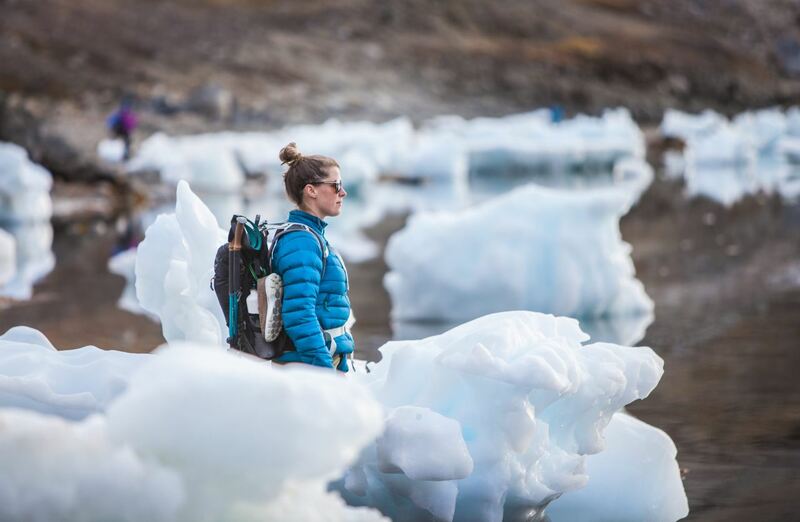 On this tour, we trek from the Qinnertivaq fjord over to the Sermilik fjord and over to the tiny hunters village Tiniteqilaaq. 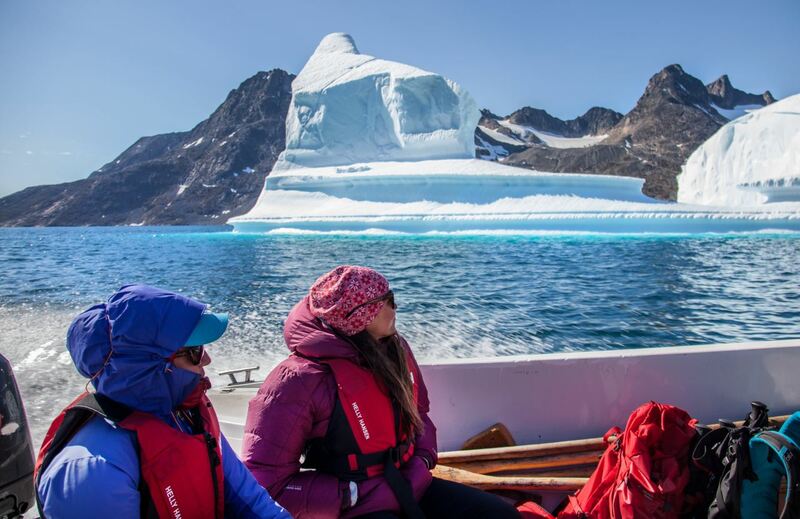 We will pass by a number of impressive alpine granite mountains, try to catch some trout in the sea, enjoy the stillness and quiet, admire the icebergs, tell stories and listen to stories. A unique adventure in breathtaking nature. 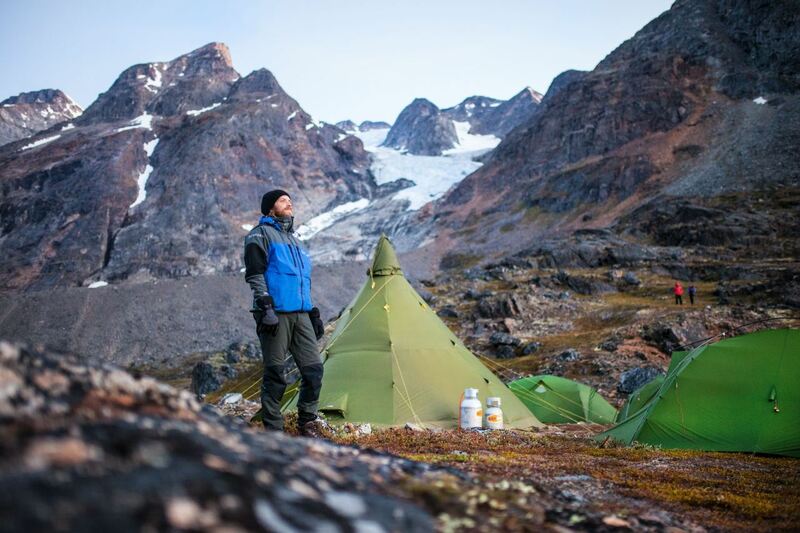 Included: Guide, breakfast (5), lunch (5), dinner (5), tents (incl. mattresses) and camping equipment. 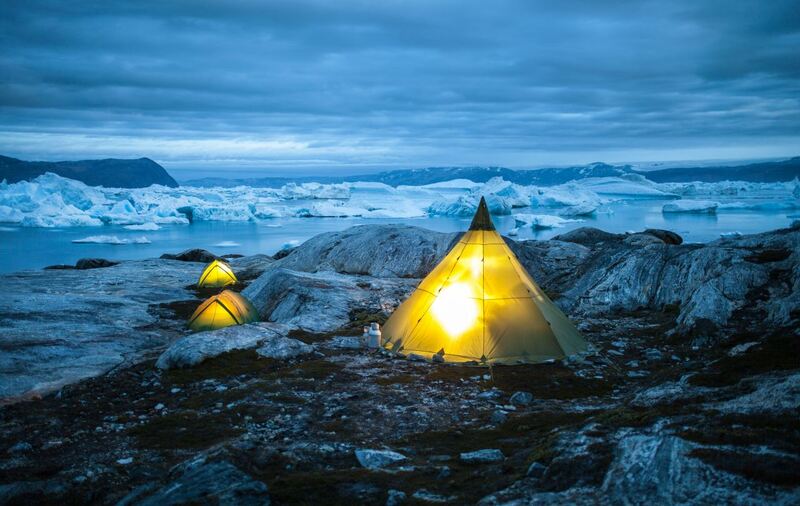 Accommodation: Hostel in Kulusuk (1 night), tents (4 nights). Transport: Boat transfers, and luggage between camps while trekking. Not included: Flights to/from Kulusuk (can be added on the first and last day of the tour - please choose when you book online). Sleeping bag (can be rented). personal equipment, insurance and expenses. Flights for Reykjavik-Kulusuk-Reykjavik are from 585 Euros + taxes. The price depends on the available flight seat on the concerned date. Tip! 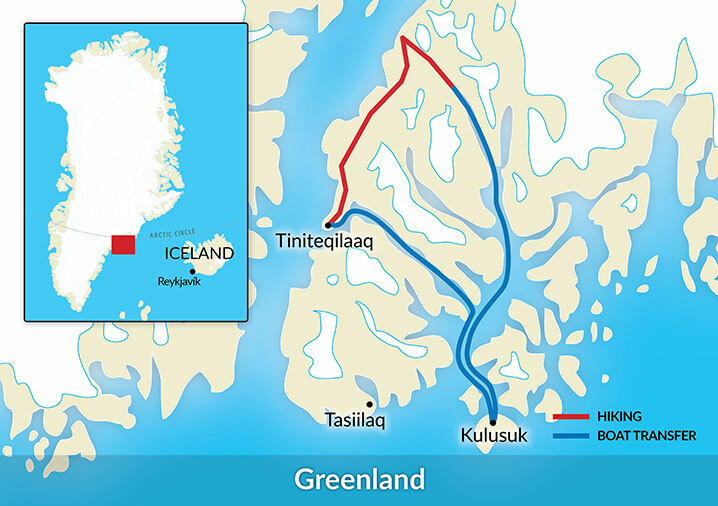 This tour can be combined with our Laugavegur Trek in Iceland for a full Iceland/Greenland experience. We arrive to Kulusuk in the late morning. We walk from the airport to the village of Kulusuk (3km/ 2m) - a village of some 300 inhabitants and visit the local shop as well as the tiny family run museum/collection. 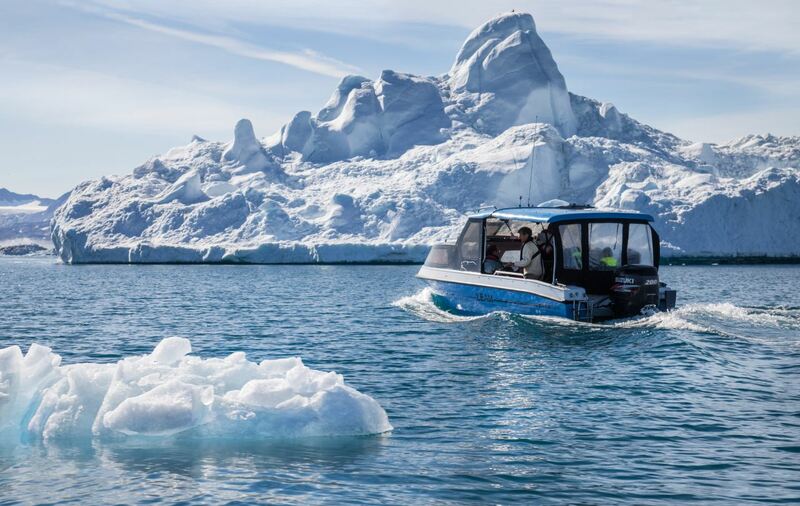 In late afternoon we travel with a speed boat to the Qinertivaq fjord passing beautiful icebergs along the way. 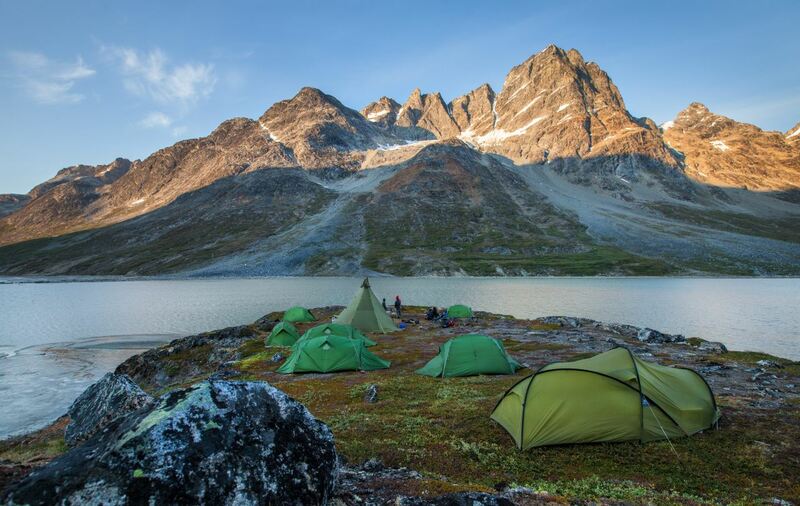 We build our camp for the night at the bottom of the fjord, in a magnificent setting, surrounded by 1600m (5250 ft) high, steep granite mountains. Walking: 1 hour. Boat: 1,5 hour. Day 2. Sun Gate, Trout Lake and Sermilik Icefjord. After breakfast we walk towards the Sun Gate mountain by the Trout Lake. Admire the reflection of the high mountains in the lake before continuing to its south end. After fording a small river we continue down a narrow valley still surrounded by high granite mountains. 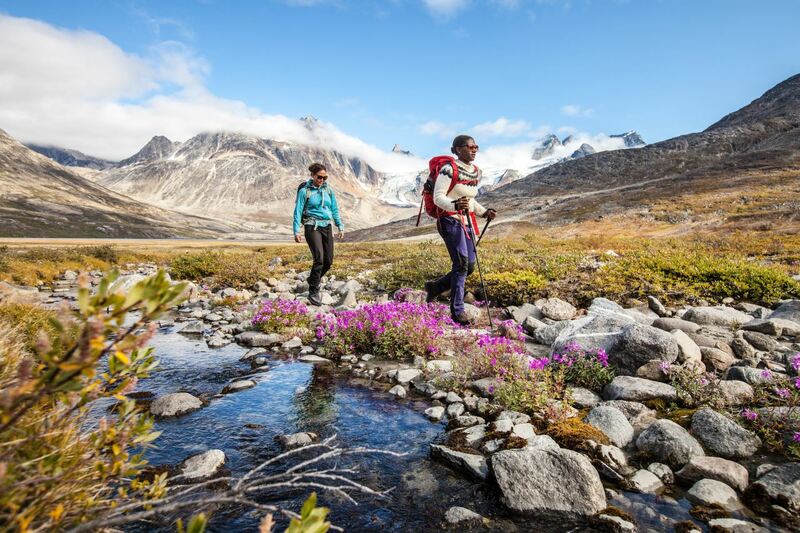 On our way we see rich arctic vegetation, willows, arctic craw berries and blue berries bushes (hardly lifting from the ground) and arctic flowers of all kinds, the most notable beeing the Arctic River Beauty. In the afternoon we start to get a view over to the west to the enormous Sermilik Icefjord, filled with icebergs of all sizes. 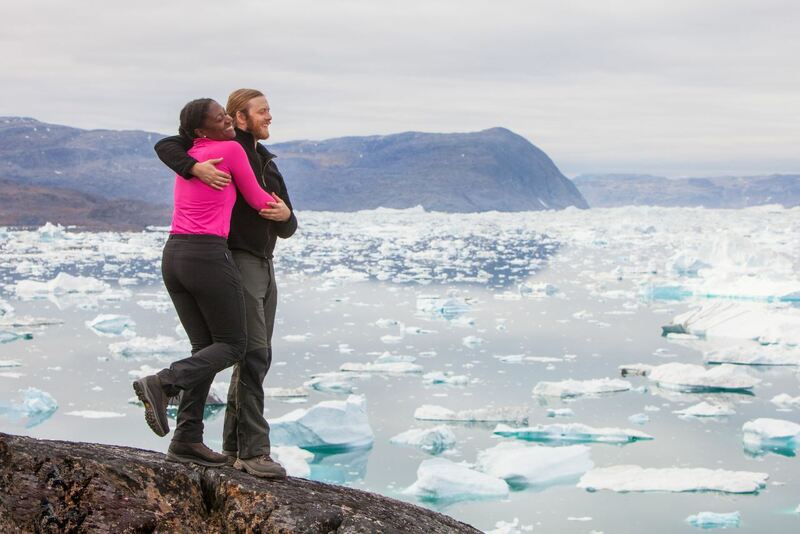 The view is simply breathtaking with mountains and icebergs and the great Greenland Ice cap lurring behind! Camp at the fjord. Walk 17 km (10,5 m), 7 hours. Ascent/descent: 300 m.
We start our walk along the impressive icefjord. A tiny path takes us across steep boulder slopes and down to a small sand beach covered in small icebergs on low tide. A second beach has even more stranded icebergs. We cross the Iceberg Beach and on our way we ford a small river. We continue at the foot of high mountains, across scraped granite „whale backs“ and arctic tundra wetlands before arriving to a small peninsula called Paarnakajiit where we put up our camp. Walk 14 km (8,6 m), 6 to 7 hours. Ascent/descent: 200m. Day 5. Amitsivartiva narrow fjord to Tiniteqilaaq and Kulusuk. The day starts with the climb up along a mountain ridge abow the Sermilik Icefjord. We climb to a fantastic view point at 500 m (1800 ft) and admire the vast view over the Icefjord to the west and the „Matterhorn“ like mountains to the East. We continue along the ridge with great view on both hands until we descend into Tiniteqilaaq, a tiny hunters village with less than 200 inhabitants. After a short visit of the village we take a boat to Kulusuk for the last of the trip. Night in a hostel. Walk 14 km, (8,6M), 7 hours. Ascent/descent: 500m. You can enjoy your last hours in Kulusuk, and later we will be back at the airport where our flight to Reykjavik will be waiting for us. Flight back to Reykjavík. A duffel bag for the transport of your overnight gear between camps. Please avoid bringing a suitcase! Backpack for extra clothes and food during the day. A 30-45L pack should be enough. Change of clothes for wearing in the camp. For your own wellbeing and safety we strongly suggest following the advice of our equipment list, this includes having good quality rain-gear, tops and bottoms! Also respect that cotton clothing is not appropriate for any strenuous outdoor activity – this includes jeans and t-shirts. 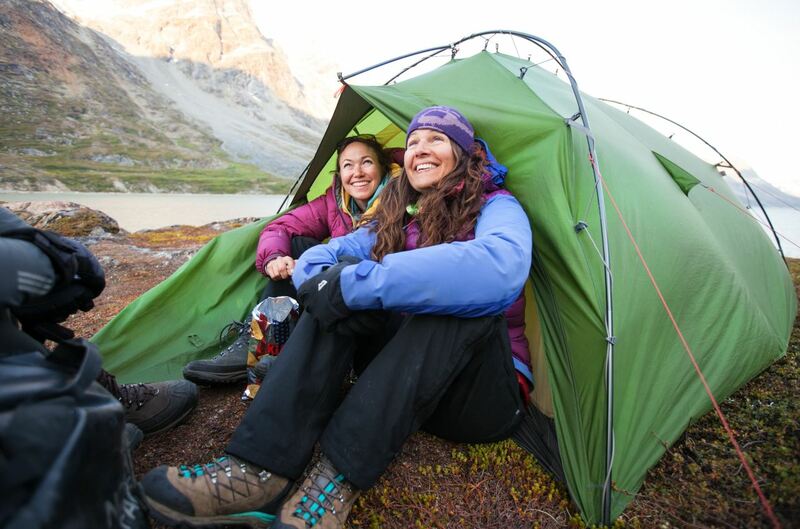 Modern outdoor clothing is by far more comfortable and will greatly improve your experience. 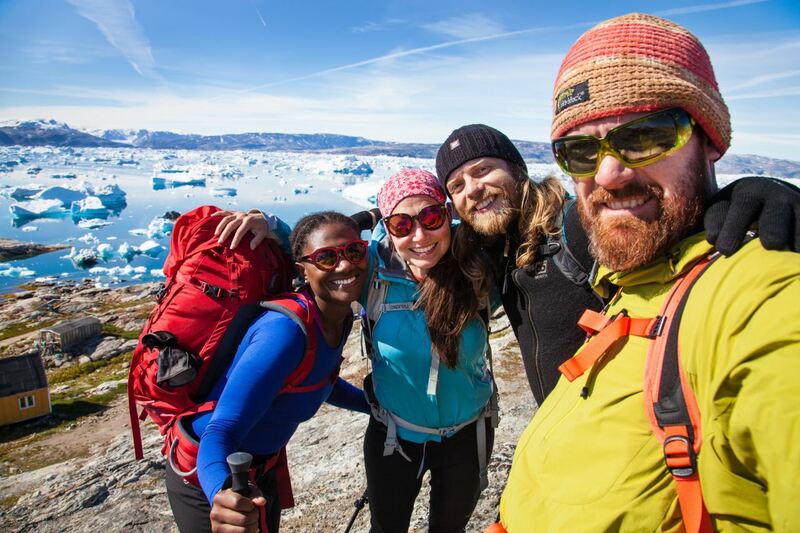 Gear transport in Greenland happens on boats with limited capacity – both in volume and weight – please limit your personal equipment to 15 kg. and pack it in a soft duffel bag or comparable.